Remove the tray from the oven and flip the fennel. 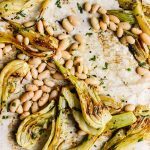 Add the white beans to the tray and return the tray to the oven and roast for another 5 minutes or until the fennel starts to brown. Remove from the oven and set aside. Meanwhile in a small bowl whisk together the remaining 2 tablespoons olive oil, lemon juice and parsley with a pinch of salt and pepper. Pour the mixture over the fennel and white beans, toss and serve warm.